This is a large national park north of Seoul, covering 78 square km. It’s a great place for a walk, hike, or trail run. Most of the trails are wooded, with varying surfaces. There are thousand-year-old temples, huge seated Buddhas carved into the sides of mountains, the Pukhansanseong (“Northern Mountain Fortress”), waterfalls, and all manner of exotic birds, surrounded by gorges and granite peak. There are great views, as well. There are several signed paths that are great for trail running. From the south-area entrance at Ui-dong (nearest to the city), you can select between a 9.1-K north-south trail (“Traversing Course”), an east-west 6.5-K (“Crossing Course”), or circular 7.1- and 8.1-K trails, among others. 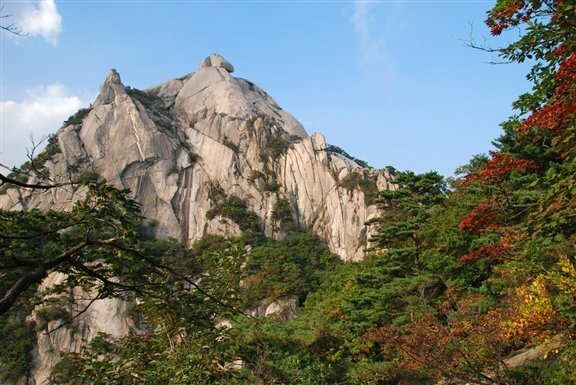 A more challenging option is to attempt Bukhansan Mountain, the highest peak of the city. It’s a challenging ascent but there are great views. Start at Bukhansanseong Hiking Support Center near Gupabal Station.